Samsung seems determined to get its traditional home button and capacitive keys out of the equation for all of its devices going forward this year. We know the upcoming Android Go smartphone will have software navigation keys and so will the Galaxy Tab S4, despite neither of the two devices sporting an Infinity display. Well, we can now add another upcoming Galaxy device to the list. 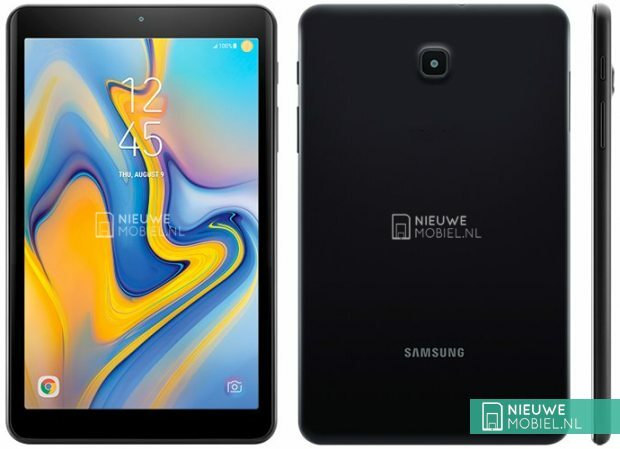 NieuweMobiel.NL has published what look like official press renders for the Galaxy Tab A 8.0 (2018), showing a clean front side without a home button. It shouldn’t come as a surprise that Samsung is looking to move to virtual navigation keys across the board. The company has always been about consistency, and while it stuck to physical and capacitive keys for years so that its customers would feel right at home with every new Galaxy they purchased, the same goes for switching to software keys now that physical keys have been removed from the Galaxy flagships. From the images, it seems the successor to the Galaxy Tab A 8.0 (2017) will have a few more changes to the overall design. The bezels around the screen are smaller, and Samsung seems to have employed 2.5D glass for a more premium look. However, as the publication notes, the slightly curved display edges may only be an optical illusion, so we will need to wait for the official reveal to be sure. Speaking of an official reveal, the renders of the tablet have the date August 9 on the lock screen, though it’s far from likely that Samsung will launch a budget tablet alongside the Galaxy Note 9. The 2017 model was released sometime in September, so we can expect the 2018 Galaxy Tab A 8.0 to show up around the same time this year. As for specs, one can assume budget hardware with Android 8.1 Oreo out of the box, though more details will be needed for a clearer picture of where the Tab A 8.0 (2018) will stand.